It's more than a place, it's a state of mind! Planning a trip to Gothenburg? Nearly 25,000 people visit Gothenburg each year. See below for pictures and information to plan your trip. Need more detailed information? Visit our business directory for contact information and addresses. Gothenburg is home to two Pony Express Stations. The Midway is on its original ranch site south of Gothenburg. The Sam Macchette station is located in Ehmen Park just 1 mile north of I-80 at 15th & Lake Avenue. The station in the park was used as a fur trading post/ranch housing along the Oregon Trail southwest of Gothenburg before it was used as a Pony Express station in 1860-1861. It was moved from its original site and rebuilt in Ehmen Park in 1931. The museum has been open to the public since 1954. Hours are 9 a.m. to 7 p.m. in the summer months, 9 a.m. to 6 p.m. in May and September and 9 a.m. to 3 p.m. in April and October. Organized in 1980, it’s purpose is to gather, preserve and make available records and other material relating to the history of Gothenburg and the surrounding area; to stimulate an interest in and knowledge of, the locality’s past, to discover and collect any material which may help to establish or illustrate the history of Gothenburg and the surrounding area and the exploration, settlement, and the development of it. FREE ADMISSION. This memorial to the first settlers in the area features a barn, sod house, windmills and life-sized barbed wire sculptures. Located behind the barn, which is filled with memorabilia and photographs, the sod house is a replica of the early homes with sparse interior reflecting the hard times faced by pioneer families. 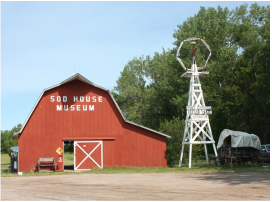 Take Exist 211 off I-80 and drive one block north to relive scenes from our pioneer heritage. FREE ADMISSION.